Happy Birthday Lucy Liu!! She turned 46th today!! I made 9 GIFs in her honor from her TV series, Elementary. Season 3 Episode 1 featured a telescopic baton fight! 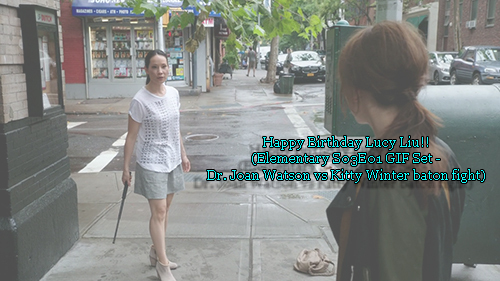 The confrontation was between Lucy Liu's Dr. Joan Watson and Ophelia Lovibond as Kitty Winter, Sherlock Holmes' new protege. Wishing Ms. Liu, one of my favorite actresses, all the best on this most special of days!